Traversing the world of beer…one pint at a time. Not a great pic, I know...but the best I could do without a blinding flash! A little over a week ago Andrei and I stopped by one of our favorite beer bars in SF, Church Key. Despite it being in one of the worst areas in San Francisco to find parking, it has a great selection of beer, a cool atmosphere and to top it off, a killer Foursquare deal. While perusing the menu we came across Shmaltz Brewing Company’s Bittersweet Lenny’s R.I.P.A on Rye. Seeing that it was a “limited engagement” beer, we opted to go for that. Church Key was selling the 22 ounce bottle for $25, but with their foursquare deal we got it for $12.50. SCORE! This beer had a beautiful amber color to it with an off-white frothy head with a lot of lacing on the glass. You can definitely smell the whiskey barrels that it was brewed in (to me it gives an almost vanilla-like aroma) as well as caramel. It has a light carbonation to it and the taste is rich and delicious. This beer is barrel-aged in Sazerac 6 year rye whiskey barrels and is 10% ABV. I’m giving it 5 out of 5 pints although maybe I’m being a bit biased because a)I love barrel-aged beer and b)It’s the best I’ve had from Shmaltz so it was a wonderful surprise to find such a tasty brew from a brewery I wasn’t a huge fan to begin with. Because they’ve limited the release on this I would have to say to buy it if you see it! Yes, there are better beers out there but this is a sweet gem from Shmaltz that is worth tasting! 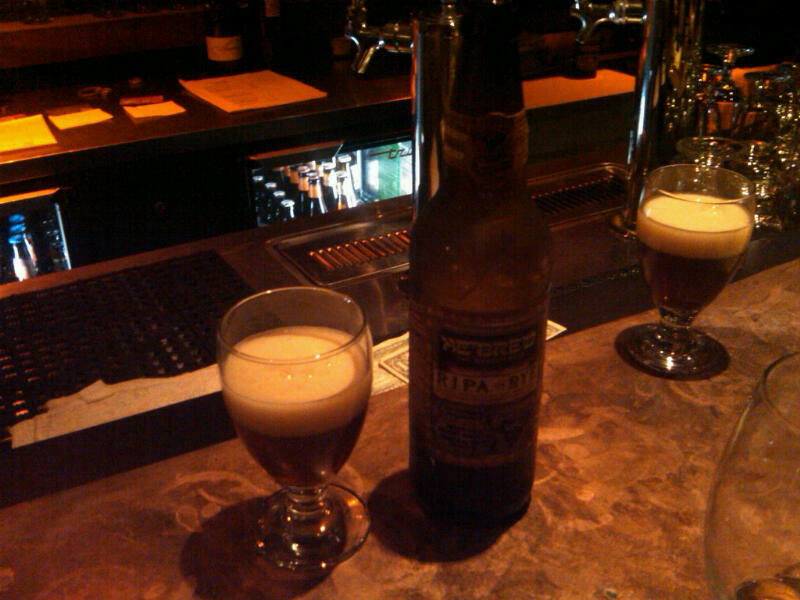 This entry was posted in Beers, Places and tagged barrel aged, Shmaltz by Melanie. Bookmark the permalink. That is an awesome deal, considering the prices of some of those bottles. 🙂 We’ll have to stop in one of these days – I haven’t been back there since around when they opened. I totally love the beers from Shmaltz. Well most of them anyway. RIPA is fantastic and I’m so grateful that we can actually get it here in Texas…as a lot of the great northeastern beers we just don’t get down here. Adding to this, I love rye whisky, so naturally these two match so incredibly well for me. Have you had the chance to try anything else from them yet?